Q.>>>: When I last changed my air filter, I noticed that the bargain filter element had failed. The glue used to hold the fiber webbing to the black plastic frame had not held. I replaced it with a "Purolator Premium", which has two additional plastic ribs holding the filter media in place. The filter element cost over $21. What are my options for an after market air cleaner with washable filter media? The OEM stock replacement drop-in and the K&N drop-in elements are both made to much tighter tolerances than bargain filters, and both provide very good filtering. 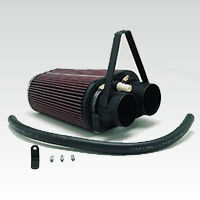 The K&N is re-usable, but it is close to twice the price of the OEM filter (~$40). But it is still the more economical choice, since it is only a one-time purchase. Because of its design, the K&N drop-in is also a bit less restrictive than the stock filter, so you will see a slight increase in horsepower. The choice that many of us on the Team3S list have made is to replace the stock airbox entirely, with a K&N FIPK (Filter Injection Performance Kit, ~$145). It is an oval housing and element, installed in about 1/2 hr, which is totally legal and still maintains your warranty. It comes with a CARB-rated, numbered metal sticker, with chapter & verse references for emissions inspectors, and a warning to service techs NOT to discard the filter element, since it is re-usable. This oil-treated filter needs infrequent cleaning (except in VERY dusty environments), and it actually works BETTER, the dirtier it gets! It has the added benefit of letting much more air into your throttle body, which probably prolongs the life of your engine by making it work less hard at high revs to get the air it needs. Because of its truncated oval cone design, the FIPK has close to twice as much surface area as the stock filter. And another "little perk"-- it gives you a nice, healthy boost to your stock horsepower. You can FEEL the difference! When we tested a Stealth NT on a dyno after installing an FIPK recently, it showed a 6 HP gain over stock! (The bigger engines will surely show more like 12 hp - and K&N claims up to 15 hp). It feels like the engine had been 'held back' with the stock airbox. Even if you're not into "mods", this is a smart, simple modification that everyone should make. Highly Recommended! Recent independent tests have shown the FIPK to be the best aftermarket filter out there, but it isn't the only one... Many other filters are available that are better than the stock filter - including offerings from Stillen, and others. That discussion will be added to our Team3S FAQ Pages shortly. 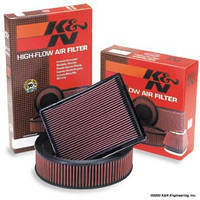 K&N Filtercharger (#33-2045) - Made for all years of 3S cars. This is a direct "drop-in" replacement for the factory air filter, but made to tighter tolerances, and slightly less restrictive than stock. This will give you several additional HP. K&N Aircharger (#63-1000) - Designed for the 95-and-up Eclipse (&DSM) 2.0 L. engines, but fits all 3000GT & Stealth MAS units. Like the FIPK, (but slightly longer), it completely replaces the stock air box. Non-Emissions Legal: Aircharger Kits Are Not Legal For Sale Or Use On Pollution Controlled Vehicles. These Kits Replace The Original Air Filter Box And May Eliminate Or Defeat Some Emission Controls. K&N FIPK (#57-1500) - (Filtercharger Injection Performance Kit) - Made for all years of 3S cars, it completely replaces the stock airbox. It comes with a CARB sticker, and is street-legal in all 50 states. This is the preferred unit for our cars - but some members swear by the Stillen, which is also street legal, and comes with a CARB sticker. This will give you 10-15 additional HP. K & N Images © 2002 K & N, All Rights Reserved.